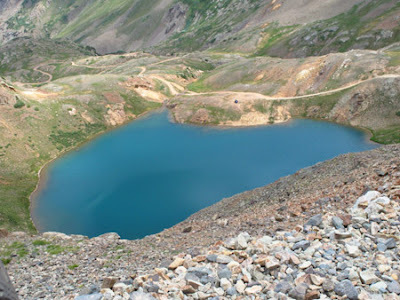 We’re standing at an elevation of almost 13,000 feet at the top of California Pass in the San Juan Mountains, transfixed by a brilliantly blue lake below that mimics the deep hue of the sky. 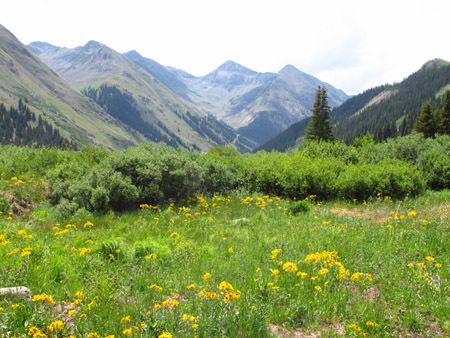 It’s clear, sunny day, perfect for exploring mountain trails in southwestern Colorado. 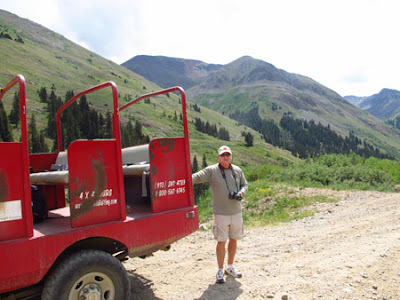 Larry and I are on a jeep excursion with Mild2Wild Rafting and Jeep Trail Tours. For several hours we’ve been jostled on sharp hairpin turns as we ascended to this high point of our journey. Snow lingers on the mountains, and some folks can’t resist an opportunity to crunch their feet in the winter remains. We climb a rock hill to better appreciate the wilderness and natural beauty all around. We had boarded a van in Durango that arrived a little more than an hour at the quintessential western town of Silverton. 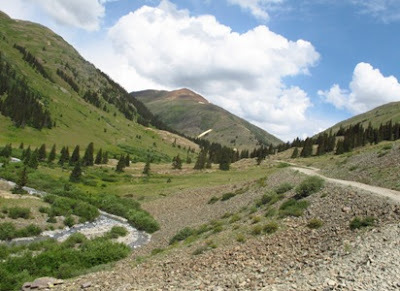 Along the way, we crossed Coal Bank Pass and Millers Pass, each just under 11,000 feet elevation. Fields of white, yellow, red, and purple flowers brightened the roadside. Our guide pointed out North Twilight Peak, which is over 13,000 feet and gets the last sunlight of the day. 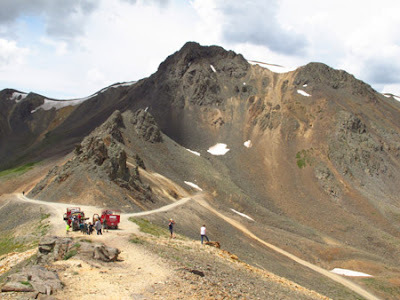 At Silverton folks in our group pile into four-wheel drive military style vehicles and pick-up trucks outfitted with benches that seat 8-12 people. Our driver, Mace, who has been in Colorado for three years, takes us on a graded dirt road past Mayflower Mill, a mine that was in operation until 1982. Self-guided tours are available to peruse this scene often used for movies. We pass by the remnants of old mining towns including Eureka, now a ghost town abandoned when the Sunnyside Mine closed. Concrete structures built after 1919 remain standing. In its heyday up to 1200 tons of ore were mined a day, with 35 per cent of material mined yielding gold. At Animas Forks, which was settled in 1858, we got out and walked around the dilapidated buildings, including the Duncan House with two floors, and a house that had the first inside bathroom. Trails took us to several old mining towns. We’re driving on an old railroad bed along a toll road with a 70 percent grade going up. I let my body hang loose like a wet noodle to absorb shocks from rugged terrain. We learn that the San Juan Mountains, part of the Rocky Mountains, are one of youngest, steepest, and most complex ranges in U.S. Only 10 percent of skiers come here because it’s so challenging. Trains traveled only three mph on this steep path. Mining could be an easy way to make money, although the process was often dangerous. 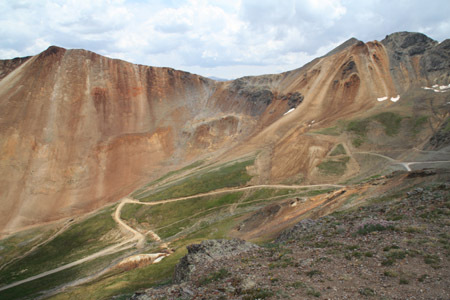 More than 200 deaths occurred from avalanches alone during the active mining period. Mace tells about Otto Mears, a Russian immigrant, who had a huge impact on this area. He was responsible for constructing 500 miles of roads, and he purchased trains and built railroads. He was also a chief negotiator with Utes because getting to the mines involved crossing Indian territory. Throughout the tour we’re enthralled by outstanding views all around. Landslide areas are visible, and forests of spruce trees become more noticeable as we begin our descent after Hurricane Pass. Downhill is fairly treacherous with loose rocks, tight turns, and steep inclines. About 15 miles from Silverton the road improves, and we relax a bit knowing lunch and a train ride back to Durango await.